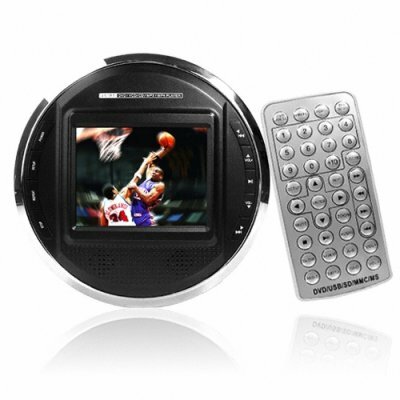 Successfully Added Portable DVD Player - 3.5 Inch Screen + Super Audio Settings to your Shopping Cart. Probably the smallest fully functional DVD Player you will ever see! Super Portable and Lightweight DVD Player with a built in 3.5 inch TFT screen, and many incredible audio selections for getting great audio sounds out of your DVDs and CDs. Plays all regions of DVD, CDs including photos, and you can plug in your memory stick or SD card to view pictures from your camera. AV cable provided for connecting to your TV. Remote control and full English language menus. Audio Selections include 7 EQ modes, Bass and Treble boost, and even a Reverb mode for making the audio sound as if it were in a Church, Concert Hall, or even (if you want) a Bathroom. You will also be getting the capacity to play almost any disk you could want including HDCD and DVD +/- R and RW. Added to this is an adjustable password protected Parental Control to keep inappropriate material away from your Children. Really liven up your room, or make those boring plane or car trips more enjoyable with Chinavasion's great Portable DVD Player with an included 1 year Warranty.. I just got my sample of this and i am impressed- its small so easy to carry, but the screen is big enough to reasonably watch videos on the airplane or bus. Battery lasts a full movie length - longer if you are not using the screen. Recommended.